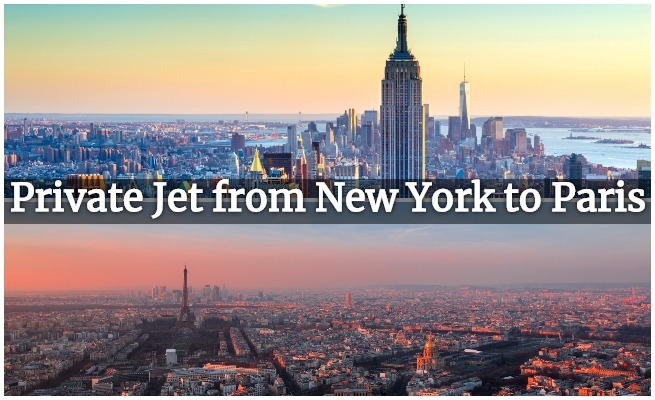 Charter a private jet from New York to Paris with Private Jets Teterboro, the #1 source for luxury flights and business jet charters in New York City, NY. Enjoy instant access to the best deals with 24/7 on-demand charter services at Teterboro Airport (TEB), Westchester County (HPN), and other airports in the NYC metro area, upstate NY, and across Long Island. New York City and Paris are cultural icons of their nations, and two of the most important financial centers in the world. NYC to Paris is becoming one the most popular international routes for private jet charters, and the airspace surrounding Paris Le Bourget Airport (LBG) is dedicated to handling large volumes of luxury planes and business jets. Call our jet charter specialists and get connected to more than 10,000 charter planes for private jet charters to Paris. We’ll comparing rates from our network of approved operators to offer you the best deal on your flight, including hundreds of private planes based in Teterboro, White Plains, Farmingdale, and at private airports near you. After booking your charter flight to Paris, we can custom tailor your experience with luxury concierge services including indulgent in-flight meals, luxury ground transportation, helicopter charters, and more. We can also pre-clear your flight with customs & immigration to ensure a smooth arrival. In addition to arranging flights at Le Bourget, your plane can arrive at Charles De Gaulle Airport (CDG), Paris–Orly Airport (ORY), and other local airports near Paris, France. Looking for a private jet from Paris to New York? We have incredible rates on private plane charters across Europe for clients returning to New York, NY. For pricing and availability on a private jet from NYC to Paris, or for more information on aircraft rentals in the New York area, e-mail us or give us a call at (888) 987-5387. Do you routinely fly first-class from NYC on a wide range of domestic and international flights? Upgrade the way you travel with a tailored jet card membership to match your needs, available in 25, 50, and 100 hour increments. Although we focus on-demand jet charters, every client has different needs, and we’re happy to discuss the benefits and limitations that come with jet card memberships. Give us a call to review a variety of private jet memberships with our team to help make the best choice for you, your family or your business. The cost to rent a private jet from New York City to Paris starts at $100k for a heavy jet, $120k for a long range jet, and $240k for VIP airliners. Due to the distance of the flight, a heavy jet is required to make the trip non-stop. Super Mids may be used, but will require a fuel stop in Iceland. Take a look at some example costs to charter a private jet from New York, NY to Paris, France. Executives and HNWI’s located to the north of Manhattan or in southwest Connecticut prefer departing via Westchester County Airport (HPN) in White Plains, located just minutes from some of New York’s wealthiest neighborhoods. It’s closer to everyone north of the Bronx than Teterboro, and can accommodate large, wide-cabin jets just as well. Heavy jets provide outstanding comfort for multiple passengers during transatlantic flights, and typically offer seating for up to 12-14 passengers. Popular charter planes available at HPN including the Embraer Legacy 600, the luxurious Gulfstream GIV-SP; the Bombarider Global, and Gulfstream G550. As two of the world’s most important financial centers, many investment firms, insurance groups, Fortune 1000 companies, and other large corporations & organizations have offices in New York and Paris. The long flight from Teterboro Airport to Paris Le Bourget is one popular transatlantic charter flights, often booked as a next-day return for executive groups. Long range jets like the Gulfstream GV, Gulfstream G550, and Bombardier Global 5000/6000/Express are all ideal options for executive groups traveling to Paris. Most long range jets offer seating for up to 14 passengers, fully enclosed bathrooms and wardrobes, flight attendants, optional beds, and all the business amenities to turn your charter plane into an executive office in the sky. Wide-cabin, long range jets are required to reach Paris, but what happens when they don’t fit enough passengers? Move up to a VIP airliner, inlcuding the Boeing Business Jet (BBJ) that seats up to 18-19 passengers (higher capacities available). Chartering a private airliner can be the perfect solution for corporate air charters, as well as destinations weddings, sporting events, and other special events in France. They can also be utilized by sports teams, touring musicians, and cargo flights. Cabin configurations can vary from standard layouts, while other may include customized VIP lounges, meeting rooms, executive offices, and more. * Pricing shown above are examples of previous flights, and will vary based on aircraft type, scheduling, fuel prices, re-positioning, and other factors. Additional services such as de-icing, in flight catering, additional time in the sky due to weather or ATC, wi-fi charges and/or ground transportation are billed separately. Additional airports are available in NY and Paris, and may increase/decrease the cost of your flight. Avoid the long lines and busy terminals at JFK, LaGuardia, and Newark Liberty by arranging your charter flight to takeoff from Teterboro Airport (KTEB), NY’s #1 private jet airport. You can conveniently arrive just minutes before your flight, pass through the private terminal, and quickly board your plane—no more showing up 3 hours early to pass through time-consuming checkpoints. The time from arriving at Teterboro to taking off can be as a little as 5—15 minutes, and when you’re in the sky, you’ll enjoy more comfort and privacy than any first-class flight across the Atlantic. After you arrive in France, we can arrange for a luxury automobile or private helicopter to bring you from the tarmac straight to meetings, resorts, or your preferred destination. The NYC Metro area is home to several airports, including major international airports and domestic airports with scheduled airline service. Private planes have their own airports in NY, with business jets and executive flights using Teterboro Airport in Teterboro, NJ; Westchester County in White Plains, NY; or Republic Airport in Farmingdale, NY. 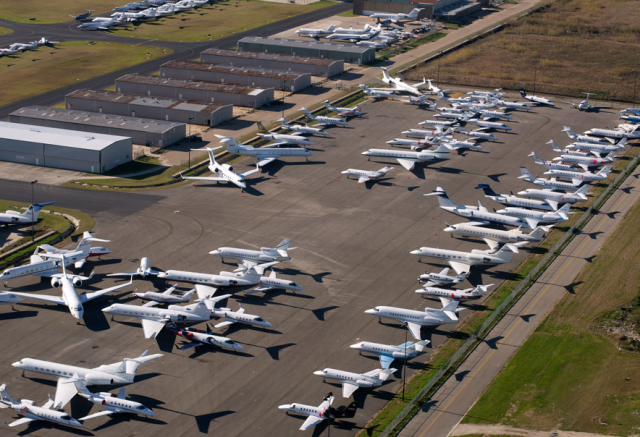 Despite being in NJ, Teterboro is the most popular option for private flights from NYC. The airport specializes in private aviation thanks to its runway’s weight limit which prohibits scheduled airline service, and 6 private terminals (FBOs) supporting executive travel. Paris–Le Bourget (LBG) the busiest executive airport in Europe since 2007. Located 7 miles (11 km) northeast of the city center, Le Bourget is dedicated exclusively to private aviation and business jet operations; commercial services, like at Teterboro, are not available at Le Bourget. Need more benefits? It’s the closest airport to the center of Paris, it’s open 24/7, it doesn’t require aircraft slots, and with 7 private terminals – the most in Europe – it’s a true business jet hub where travelers can enjoy exceptional guest services and seamless arrivals/departures. Private jet charters are the most comfortable, luxurious way to cross the Atlantic. Private planes fly faster and higher than commercial airlines, with lower cabin altitudes to reduce fatigue while traveling. They also save time and hassles from traveling via major commercial airports, and instead arriving via private airports dedicated to luxury and business aviation. Request a quote and enjoy instant access to private jets based along the entire Atlantic Coast, no matter where you’re located. We’ll compare rates from all of the operators that meets our safety standards, finding you the best deal for each and every flight. This may include empty leg jets returning to their home airports in New York and Europe, which can substantially lower your charter costs. Long range charter jets are required for the just over 3,000 nautical mile flight from Teterboro to Le Bourget, with amenities that may include plush interiors, swivel chairs, divans, full enclosed lavatories, and standing room to navigate the cabin; super midsize jets may be available, while most will need to make a fuel stop along the way in Reykjavik, Iceland. If you’re traveling in a group of 30 or more, you can rent a corporate and VIP airliner and fly together. These airliners include the Boeing 737/747, Airbus 318/319/320, and Bombardier CRJ-200, and are perfect for corporate groups, sports teams, and special events! Most importantly, safety is our top priority for charter flights from New York, NY to Paris, France. Our charter brokers are one of less than 100 Wyvern-certified brokers around the world. Many of our clients are part of the top 1%, and our safety & service standards place us in the top 1%. Call us at (888) 987-5387 for the latest pricing and availability for private flights from New York, NY to Paris, France. For instant pricing and aircraft availability on private jet charters from NYC to Paris, contact us or give our brokers a call at 1-888-987-5387 (JETS). Our aviation services extend around the globe for domestic and intentional charter flights from New York, NY to Paris, France, and we’re available to you 24 hours a day, 7 days a week no matter where you’re located.